They say everything old is new again. Well the candles in this category are a “new” offering from us, but yet they are a very old design which we carved decades ago. We stopped selling them, because if they are burned, it is very likely that they will burn through their sides because of their narrower top. 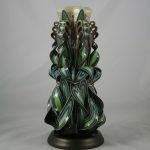 We didn’t think it was right to sell such a beautiful candle, and not be able to burn it without destroying it! But now, due to the innovation of our LED candles and the pre-drilled well option, we have decided to offer them once again, hoping that you will select these options to fully enjoy the glowing beauty of these candles. 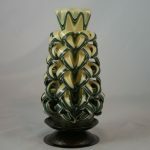 They are offered at a lower price point than our more elaborately carved candles, because of their smaller size (diameter) and their simpler design which is more easily learned to carve. We are even including the pre-drilled well option at no extra charge to make these candles more affordable for our customers. We do strongly urge you to use LED’s in our narrow top candles, and of course our LED’s are the best! A "retro" candle! This is one of the designs that we carved 40 years ago. I have seen it called the "Lantern Cut" by others, but the first time we did it, we thought it looked like a pineapple, so we have been calling it that ever since. Make Size and Pre-Drilled Well choices before viewing colors. Classic twists and turns! Make Size and Pre-Drilled Well choices before viewing colors.